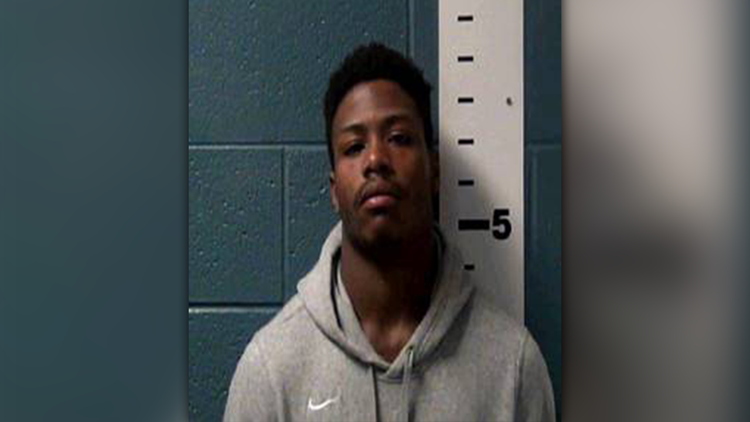 Kavontae Turpin, TCU's all-time leader in return touchdowns, was arrested Sunday for assaulting a family member, according to jail records. TCU football standout Kavontae Turpin is accused of dragging his girlfriend across the parking lot at his apartment near campus on Saturday night and then slamming her to the ground, according to an arrest warrant affidavit. Turpin, a wide receiver and special teams virtuoso as a punt and kick returner who has been suspended from the team, was arrested Sunday on a charge of assault causing bodily injury to a family member, a Class A misdemeanor, Tarrant County Jail records show. Also, on Monday, a prior arrest for Turpin surfaced: In March, he was charged with battery in New Mexico involving a woman with whom he had been in an "ongoing personal relationship," though her name was not listed in the criminal complaint. In the incident Saturday night, Turpin's girlfriend told police that the altercation started when Turpin got angry at her because he thought she was sending photos of herself to other people, the affidavit said. Turpin "refused to talk" to police about the incident, according ot the affidavit. A witness at the apartments told police that he watched Turpin "manhandle" his girlfriend, grabbing her from behind with one arm across her neck with her feet dragging as she kicked and yelled at him, the affidavit said. The witness also saw Turpin and his girlfriend hitting each other. “Texas Christian University is aware that one of its students was recently arrested for a reported domestic situation,” TCU told WFAA in a statement. “The university takes these types of reports very seriously and is continuing to gather information to determine next steps. TCU expects its students to behave in an ethical manner, abide by campus policies and adhere to state and federal law. The incident happened at the Edge 55 apartments on South University Drive, just off Bluebonnet Circle. Turpin has been released from jail, according to online records. After news broke Monday of Turpin's arrest, it was revealed that he's been playing for the Frogs this season with an open bench warrant out of Las Cruces, New Mexico. Turpin in March was charged with misdemeanor battery involving a household member, according to online records. He was also charged with criminal damage to the property of a household member and interference with communications, both misdemeanors, the records said. The charges were filed March 15, while TCU was on spring break. Turpin has pleaded not guilty to the battery and criminal damage charges, the online records said. The bench warrant was issued in July after he missed a pre-trial hearing. A criminal complaint in the case said Turpin, who was visiting from Fort Worth, grabbed the alleged victim "by her arms causing bruising to both of her arms" and also ripped her shirt. Turpin then grabbed her phone and slammed it on the counter, breaking the screen, and punched a hole in a bedroom door, the complaint said. When talking to police, Turpin said they would have to "take him to jail because he has nowhere else to go," the complaint said. The case was still open as of Monday, according to Roxanne Garcia-McElmell, a spokeswoman for the Third Judicial District Attorney's Office. When asked if TCU officials were aware of Turpin's New Mexico arrest, a university spokeswoman said she was "checking into" it Monday evening. Earlier Monday, TCU coach Gary Patterson said he was gathering more information about Turpin's Fort Worth arrest and that Turpin likely would not play in TCU's game against Kansas on Saturday. Any time missed due to discipline stemming from this incident would hurt the Horned Frogs, who are 3-4 in a down year. Turpin, a senior, is the program’s all-time leader in special teams touchdowns with six in his career. The sixth came on a career-best 99-yarder against Oklahoma on Saturday. That score, and a 41-yard touchdown reception in the second quarter, made Turpin the only player in a Power 5 conference this season to record a return touchdown and receiving touchdown in the same game, according to Mark Cohen, TCU’s associate athletic director in charge of communications. It’s also the first time a TCU player has accomplished that since 2005, Cohen said. TCU's @KaVontaeTurpin became the only player nationally this season in a Power 5 program to have TDs via a kickoff return and receiving. He's the first Horned Frog to accomplish the feat since Cory Rodgers at BYU in 2005.